'Fire Music' was Shepp's statement of intent. It could be argued that the act of homage that was 'Four For Trane' was just that - a young lion getting famous off the back of someone else's music. So in this, Shepp's first album of his own material as leader, he had a stall to set out, a vision to express, and this is exactly what he does. The themes are typical Shepp - the plight of African-Americans ('Malcom, Malcolm-Semper Malcolm') and reverence for the history of jazz ('Prelude To A Kiss'), as well as the sheer delight to be had in free improvisation and loose structure ('Hambone', 'Los Olvidados'). 'Hambone' is perhaps the most famous piece from this album. Following an introduction brimming with the kind of ensemble playing that made 'Four For Trane' so exciting (as well as some thrilling call-and-response moments between Shepp and the other horns), the horns find an insistent, driving riff in 13 that acts as the most surprising backdrop for soloists that you're likely to hear in recorded jazz. The CD reissue pulls in a live version of 'Hambone' from slightly later in the year (originall issued as part of 'The New Wave In Jazz' compilation LP (AS-90)), where the soloing is more concentrated. The big riff, though, loses some of it's power, the musicians losing time a little under the rigours of the complicated music. Not even the additional presence of Fred Pirtle on baritone sax can make a difference to this section, although his solo later in the piece is worth buying the CD for. 'Los Olvidados' is more tightly structured ensemble playing (the Archie Shepp big band, anyone?) with a satisfyingly complex feel. 'Malcolm...' is surely designed as a vehicle for Shepp, being a reading of his poem about Malcolm X, but the player who comes out of it best is David Izenon, with a superb bass accompaniment to the spoken word section. 'Prelude To A Kiss' stays pretty faithful, as you'd expect given Shepp's love for Ellington, though it's not quite as clean as some of the Ellingtonia he'd explore in the late 1970s. And 'The Girl from Ipanema'. Not perhaps the most obvious choice for an avant-garde jazz makeover, but it works surprisingly well, the latin rhythms of the original acting as a pleasant backdrop to more high quality ensemble playing. As expected, Shepp becomes ever-wilder as the piece progresses but soon responds to the steady rhythm and settles into the mould of the original. As a collection of subversive avant-garde jazz, this album holds up well. 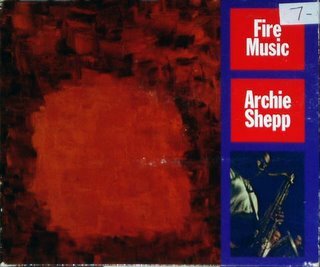 But as a set it doesn't hang together quite as well as 'Four For Trane' or 'On This Night' (recorded largely at the session that produced 'Malcolm...') but it's well worth hearing nevertheless, for a glimpse of Shepp's vision. In many ways, this was the album that set his sound for the rest of the 1960s.